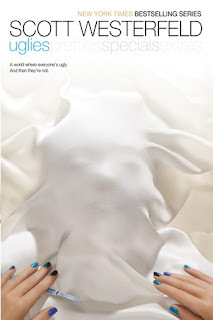 I read Uglies for the first time in 2008, so check that post for the basic premise of the novel. I went on to read the entire series and loved it the whole way through (I wasn't posting about every single book I read back then so I don't have posts about those - sorry!) I just read it again for my Not-So-Young Adult book group at work and now I'm tempted to revisit the rest of the series. The society Westerfeld has created was intended to correct the faults of the "Rusties" (that's us) who were all miserable and wreaked havoc on the environment, bringing on a final catastrophe that ended our way of life. One of the changes they made was to make everyone beautiful so that people wouldn't develop eating disorders, and to prevent people from being treated differently based on how attractive they are. It sounds all well and good in theory, but of course there is a dark side to it all. Environmentalism is also very important in this society because of the havoc wreaked in the past. I was thinking about how many dystopias are based on us causing vast environmental damage and the later society rebuilding it under very strict governmental guidance. Right now, we can't seem to get it together enough to make any environmental changes, and I really wonder if it's even possible to do without having a complete catastrophe first. Or without some government exerting extreme control over everyone's lives. It's so interesting to think about! Another thing I thought about was the idea of defying the government, the way some of the people did in this book by leaving the city and living off in the woods. One of the discussion questions I came across was something like "When is it ok to rebel against the government?" My reflex response is that it's ok if the government is wrong or oppressive, but who is the judge of that? Is it oppressive for the government to force you to vaccinate your children or to prevent you from buying semiautomatic weapons to kill each other with? Some people would say yes and some would say no. It seems very clear cut in a dystopia novel (sometimes) but real life is much more complicated. Just like the first time I read it, Uglies was gripping and full of food for thought. I love reading about this version of the future and the people who inhabit it. I have already checked out a copy of the next book in the series, Pretties, which I may or may not read. I still love this series but as usual I have a whole stack of books waiting to be read. Stay tuned to find out whether or not I finish the series again.